The walls of its two 15-foot-tall steel sentinels are patterned with lace-like cutouts that hold images of flora and fauna, and its structure is inspired by an ancient Mayan temple in Chichen Itza. 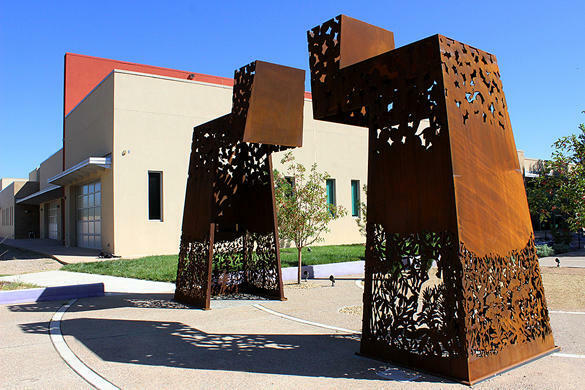 New Mexico artists Cristina González and Jacob Sisneros created Warriors Repose for Albuquerque's National Hispanic Cultural Center, located in the historic Barelas neighborhood. The work is one of two sculptures to be dedicated in a special Veterans Day ceremony in the NHCC's Manuel Mora and Pete Padilla Memorial Park. The artists say that Warriors Repose is meant to specifically honor Padilla and Mora, two young men from Barelas who lost their lives in Vietnam, and, more generally, to honor all of the local Hispanic veterans of the Vietnam War. Cristina González and Jacob Sisneros speak in greater detail about Warriors Repose and discuss the kind of introspective space they hoped the new work would create for the Barelas neighborhood.